Do you know Mr. Smith's first name? A black and white negative of Mr. Smith standing outside in front of a brick wall. A window is visible in the background. This photograph was taken in April 1938 for his chauffeurs licence. 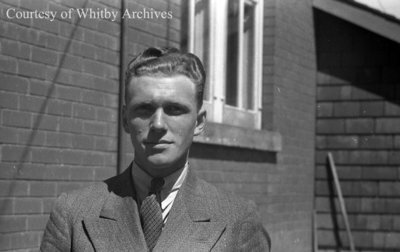 Mr. Smith, April 1938, Marjorie Ruddy. Whitby Archives A2013_040_764B.